If I could suggest a strategy for working through advancement, this is what I think would be the best arrangement for an LDS scout. Following this strategy would leave a bunch of “free time” for Varsity Scouts to focus on more outdoor high adventure activities and not have to worry about completing merit badges for rank advancement! In fact, they should be using all their merit badge skills while participating in their high adventure activities (or helping teach those skills to the younger scouts coming up)! Between 16 and 18 is generally where a lot of distraction will come from a job, cars and girls. So it seems reasonable to accomplish the Eagle rank by 16 while they’re not yet completely drawn away by these other “fumes”. Actually, earning the Eagle rank could also be used as leverage before giving them the keys to the car! Here’s a printer-friendly version of this advancement strategy I presented to my Troop Committee. Does this sound like a reasonable approach? I think if all leaders are doing what they’re supposed to be doing for their given age group, this should be realistic to accomplish without a ton of pressure, don’t you think? This entry was posted in Advancement and tagged boy scouts, bsa, eagle project, first class, leadership, life, merit badges, palms, rank advancement, second class, service, star, tenderfoot. Bookmark the permalink. I quite like your strategy, except for a couple items. Once an LDS boy turns 16 he ceases to be a Boy Scout and becomes a Venturer. At this point, he should not be working on merit badges or rank advancements at all but rather working on Venturing awards. Merit badges and ranks are not part of Venturing. Of course, earning Eagle had become such a focus that if it hasn’t happened by the time a boy turns 16, his leaders generally ignore Venturing to get him to Eagle. This is as great a disservice to the boy as withholding a driver’s license. Neither one is a good idea, in my opinion. 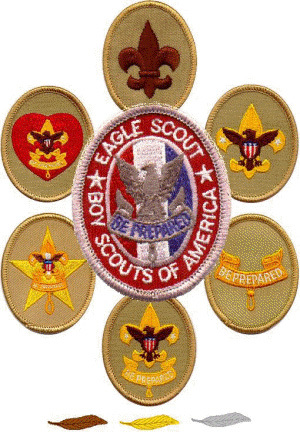 I agree with the general principle that a boy ought to be able to earn his Eagle by the time he is 16. But please don’t drop Varsity or Venturing just to do it. I don’t know much about running a “real” Venturing Crew…and neither to the Crew Advisors in my unit. I’m pretty sure no one has read the Venturing Leader Manual nor do I think the boys are aware of any Venturing awards, let alone working on them! It’s part of the dysfunction I see in my unit. I keep hearing that the boys are too busy or that they’re not interested in Scouting anymore. Yet, I believe the best age groups to experience what scouting is all about are between 14-18! Just yesterday, after venting some frustration about the lack of fulfilling other roles and responsibilities in our unit, my YM President said to me: “You can’t make people do their callings.” Really? I didn’t know the things we are supposed to be doing as adults in this program were optional. …and there’s no one who can hold anyone accountable here?! Section 4.3.1.4 from the Guide to Advancement clearly indicates that Boy Scout Rank advancement can be part of Venturing. I don’t think that we will be able to erase the culture of the Eagle Scout being the mark of great achievement for LDS Scouts. Until that culture changes to recognize the top awards in Venturing, I’m not sure that Venturing awards will be embraced.